If you like whiskey - you will LOVE Pumpkin Spirit! BATCH 10 is now available at bars, retailers and the distillery! We're never quite content with the ordinary and our Pumpkin Spirit is extraordinary. This delicious fall spirit tastes like a great whiskey. Everything you would expect of a whiskey with added depth of carmel, hints of pumpkin and some spice. 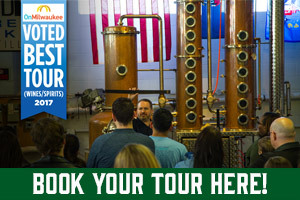 While sharing some drinks with our friends at Milwaukee's Lakefront Brewery (the best ideas come to us this way) someone made the comment that Lakefront's Pumpkin Lager could make an interesting distilled spirit. As it turned out, interesting didn't even begin to describe the resulting spirit. We liked the result and after tweaking & aging, we liked it a lot! 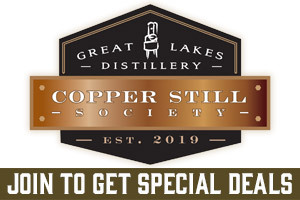 Each batch comes out in fall and is limited to a number of individually numbered bottles, so get this great whiskey like spirit quick! Batch 10 Note: Aged for years in a unique combination of woods including new charred oak, used rum barrels, bourbon barrels, beer barrels from Lakefront Brewery Black Friday, and Cabernet Sauvignon barrels from Von Stiehl Winery. From the BTI- "Burnished golden yellow color. Bright, sweet aromas of clove, nutmeg, candied ginger, fruit cake, and pumpkin custard with a dryish medium-to-full body and a spicy dusty clove gum and pumpkin cheesecake finish. Very nice". What does it taste like? Well, think of a malty whiskey with a slight pumpkin and spice flavor - nutmeg and clove come into mind. We were pleasantly surprised by how much pumpkin flavor is retained in the spirit after distillation. How's it made? We start with Lakefront's Pumpkin Lager - based on a recipe from Thomas Jefferson! It's made with real pumpkin and Lakefront Brewery makes the only pumpkin lager in existence. Carefully distilled in our pot still, we then age it in a combination of new and used Bourbon Barrels. This aging mellows the spirit which is then bottled at 90 proof. Bottles are hand dipped in pumpkin orange wax and hand numbered. (you might notice the familiar look of the label - it's based on Lakefront's Pumpkin Lager label). We think it's the perfect spirit for the cool fall weather ahead. How do I drink it? Drink it like a whiskey - because this is a great tasting whiskey like spirit! 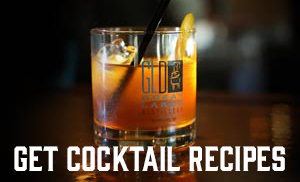 One of our favorites is as a pumpkin Old Fashioned, also great with cider. Try it straight up on a cold fall night or maybe warm with a cinnamon stick. How about a Pumpkin Boilermaker? We have several cocktails featuring our Pumpkin Spirit here in our Cocktail Database. 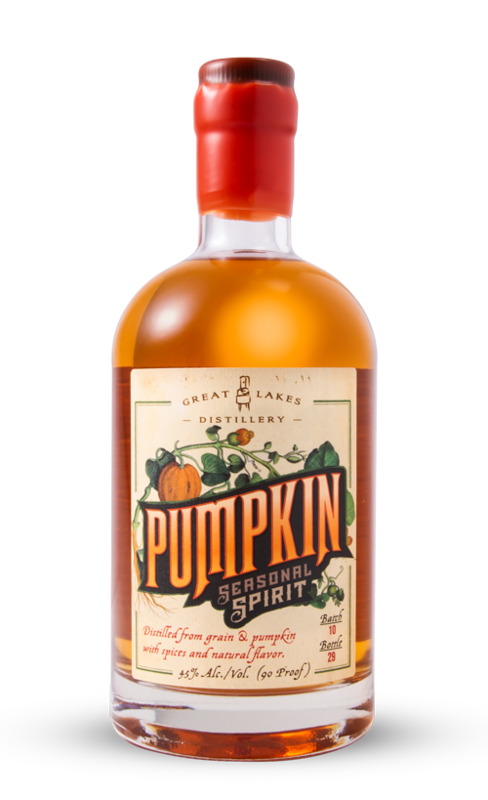 Pumpkin Seasonal Spirit is 45% Alcohol by Volume.